Somehow I let three months go by without writing a single post. I don’t understand quite how that happened, except that I suppose my adventure here has turned into what feels like normal, happy life. So, let me start with a picture of food, because really this entry should be called ‘Eating My Way Across Mexico,’ or ‘How to Gain 5lbs in 2 Weeks.’ For those of you who haven’t already been mocking me, let me share that I have been, as of late, trying to be vegan… I know. I know! Don’t start. The majority of my conversations prior to coming here usually contained a reference to my love of pork products, and yet somehow I find myself living in a yoga commune trying to eat a plant-based diet… Just let me be for now. This phase might pass, and then we can go on happily eating bacon and Cheezits together as if nothing ever happened. Anyways, the point is that all of my best vegan intentions went out the window basically immediately upon crossing the Mexican border. On the 8 hour journey from Xela to San Cristobal I was lucky enough to meet a man who runs a hostel there, and after dropping off my bags, we headed out to what he claimed is the best taco stand in the city. I tried to restrain myself and only order one chorizo and one al pastor, but after scarfing those down less than a minute I needed to go back for seconds. And thirds. The tortillas were fresh, the meat melted in your mouth, and there were three types of actually spicy and flavorful salsa, something I had been completely deprived of in Guatemala. I was in heaven. We followed up tacos with fresh coconut ice cream and a visit to a mezcaleria. Mezcal tastes somewhat similar to the way a teenage boy’s gym locker smells, but probably was successful in killing whatever bacteria I might have picked up from those street tacos. Not a bad first day. Throughout this vacation I got really lucky in meeting other fun travelers to pass the time with. At the hostel I met a world traveler from New Zealand, and I spent a day exploring with him. San Cristobal is beyond charming, it is like a version of Mexico found in a Disney movie. Spotlessly clean, dozens of outdoor garden cafes, cobblestone everything, big sweeping plazas in front of wedding cake churches… It was a treat to walk around in a dress and not get harassed, away from the smog, stray dogs and grime of Xela. In the afternoon I went to the nearby town of San Juan Chamula, which was an entirely different experience from San Cristobal. Nearly everyone was in traditional dress, which for the women consisted of a thick, black, furry, high-waisted skirt and a silky, pastel, embroidered shirt and plaited hair, and for the men was essentially a long belted dress and cowboy boots. I went into the church where unfortunately taking pictures was not allowed, and again felt like I was seeing something straight out of a movie. There were no pews, instead the entire floor was filled with lit candles and fresh flowers, the walls were lined with life-sized dolls of saints, their glass eyes fixed in different directions, and throughout the room there were groups of indigenous families performing traditional ceremonies. In the one I witnessed closest to me, a man and his family knelt in the middle of a circle of candles, chanting. The man proceeded to remove a live chicken from a box and methodically rub it over the body of his youngest son, before gently snapping its neck. The dead chicken was then placed in the center of their circle, and the family each took a swig of some sort of home-brewed alcohol, and spit it on the bird. I was completely fascinated. From there I took a walk up to an abandoned church and took in the view before busing back. 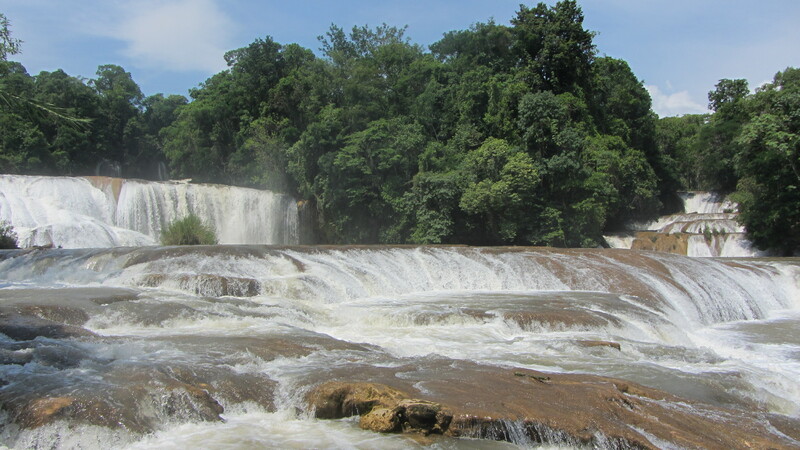 The next day I took a trip to see the ruins of Palenque, stopping off at two different waterfalls along the way. Throughout the long shuttle ride we passed signs explaining how we were in Zapatista territory, and delineating their political views. I like those Zapatistas. 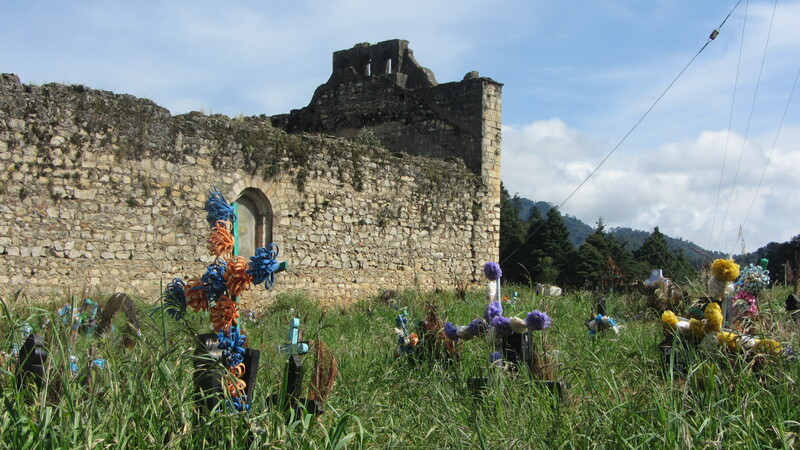 Also, I realize what a fresa (how Guatemalans say snob) I will sound like by saying this, but the ruins were just okay. Perhaps I was too hot to fully enjoy them, it must have been around 90 degrees with like, 110% humidity. I did really like the waterfalls, the first was absolutely huge and had some beautiful hiking trails along the sides. The second was tall, and you could walk around the backside of it and up to a cave for swimming. From there it was on to Oaxaca, probably my favorite stop of the trip. I took a night bus where I actually slept for the first time ever, only to be awakened at 9am by the police bringing drug dogs on board. Being the only gringa, I was given a thorough pat down, and then we were on our way. I stayed at an amazing hostel, Casa Angel, with the rooftop terrace being the main selling point. 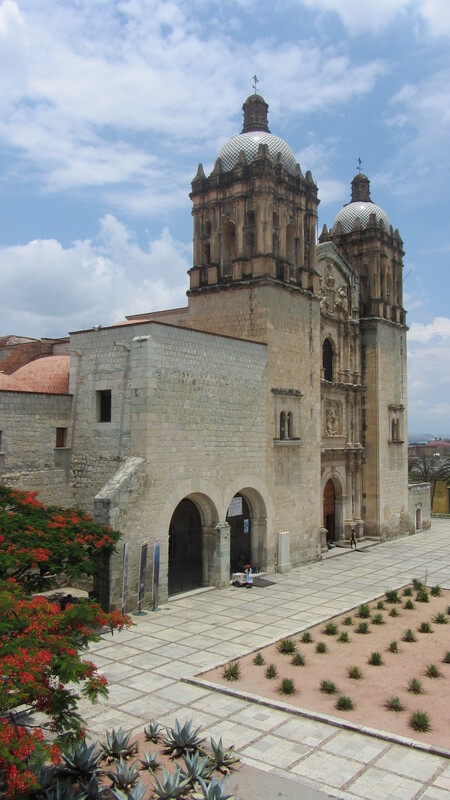 I was immediately smitten with Oaxaca, there is something really special about it that I can’t exactly put my finger on. The buildings and zocalos are beautiful, and the graffiti defacing them has to be some of the best street art I’ve ever seen. There are lots of funny, kitschy things like the milk trucks moo instead of honking, or the cross walk man ambles ever so slowly, getting faster and faster until he is at a full sprint as your crossing time comes to a close. 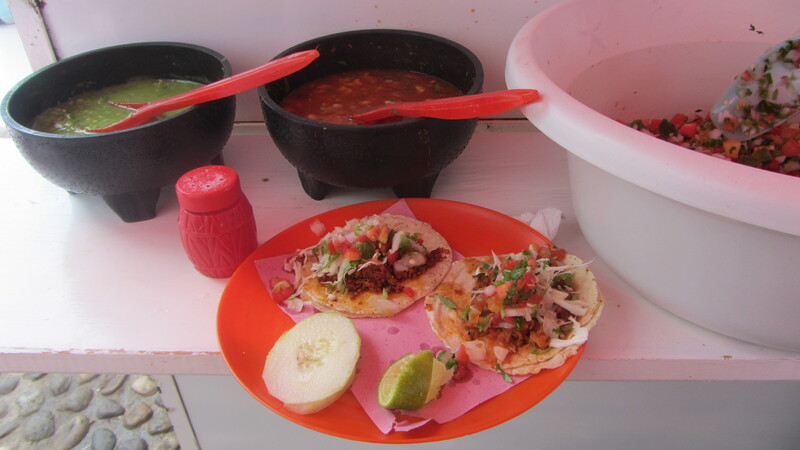 There are tons of markets and open air festivals throughout the city, and Oaxacans are famous for their cuisine. All that mixes together to create a certain kind of magic. I was lucky to meet two Irish cousins at my hostel just setting off on their world travels, and passed three days eating and rambling with them. The Santo Domingo Cultural Center on the central plaza was well worth the entrance fee and very impressive, but a little overwhelming, we were in desperate need of mid-day margaritas a few hours into our visit . We also visited a few amazing contemporary art museums, and passed a couple hours sitting in Parque Llano, watching the kids play and listening to a free concert. While I am tempted to describe in detail every delicious thing I ate, I will do my best to limit myself. First, quesillo: basically the world’s best string cheese, sold everywhere to eat on its own, but also an essential component of most meals. Really great stuff, this quesillo. Second, tlayudas: basically a giant fresh flour tortilla, folded in half and stuffed with quesillo and veggies, grilled on a barbeque, then topped with the meat of your choice. I really could go on and on, but I will stop with mole. There are seven different kinds of mole in Oaxaca, and I had a love affair with all of them. The next day during breakfast I met three hilarious Texans, and set out to explore for the day with them. 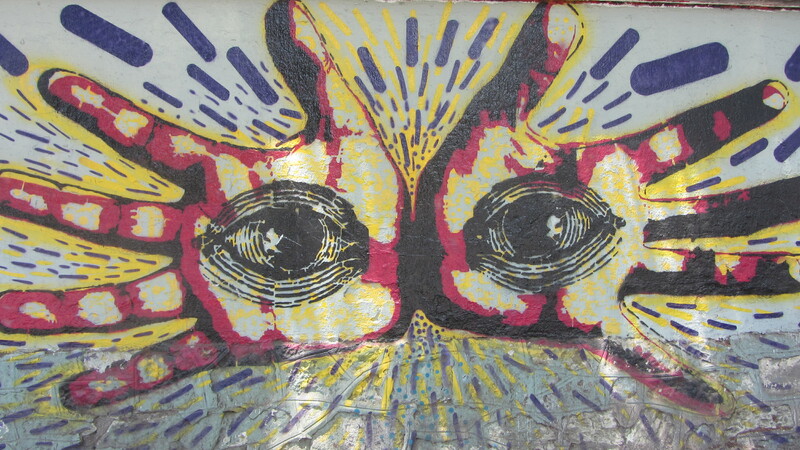 We were strolling about the hip neighborhood of La Condesa, feeling like we were in the East Village, when we somehow struck up a conversation with a pair of hip locals who worked as graphic designers at a magazine. They recommended a lunch place and offered to come meet us there in a bit. SO HIP. We made our way over to El Parnita, and then had the best lunch I perhaps ever have had, ever. The place was family run, and the owners could not have been nicer. We got a sampling of all their different tacos, with my favorite being the pumpkin flower and quesillo, and rounded out the meal with espressos and a dulce de leche pudding. 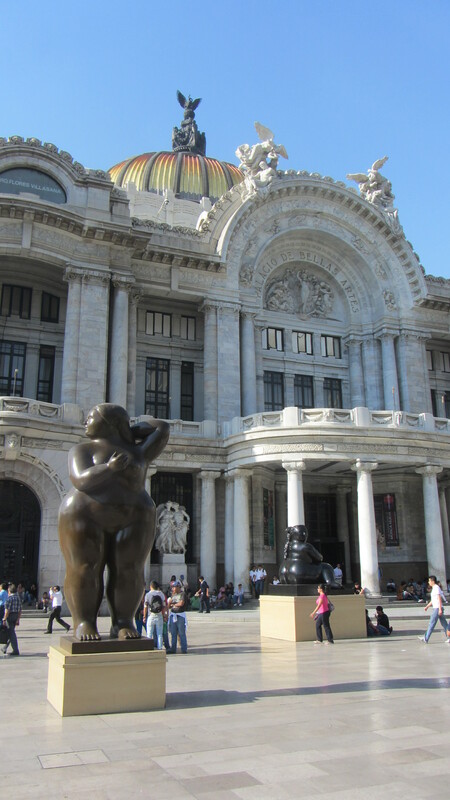 If you are ever in Mexico City you can’t miss it. From there we walked off our lunch on a long stroll in El Bosque de Chapultepec, the Central Park of Mexico City, full of beautiful nature and museums. Soon it was time for me to go, I’m sad I barely did the city justice, I will definitely be going back as soon as I get another chance. From Mexico City I hoped on a short flight to Guadalajara to visit my good pal Will. My flight was delayed so I arrived too late to do much of anything except eat a bowl of Lucky Charms and a handful of Oreos and go to bed. Very healthy. 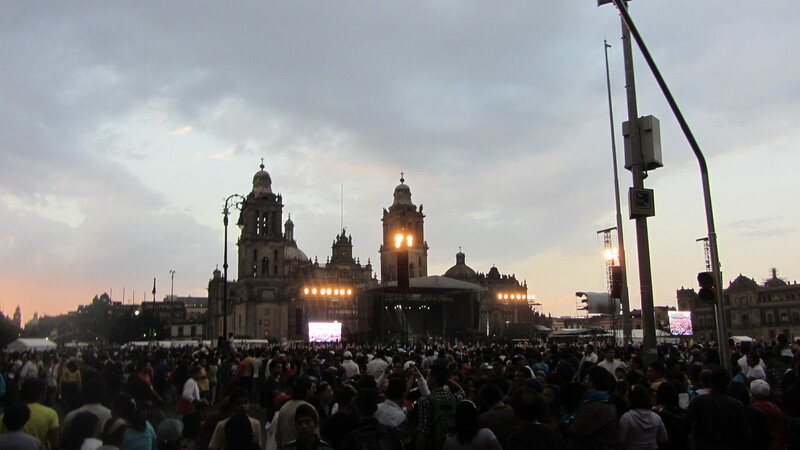 The next day I got to tour his fancy medical school before we headed to the center of the city to hit all the traditional tourist stops, including the Mariachi Plaza, where I enjoyed seeing bunches of drunk men in full mariachi uniforms, waiting for their next gig. I had a hard time not singing Vicente Fernandez everywhere we went. 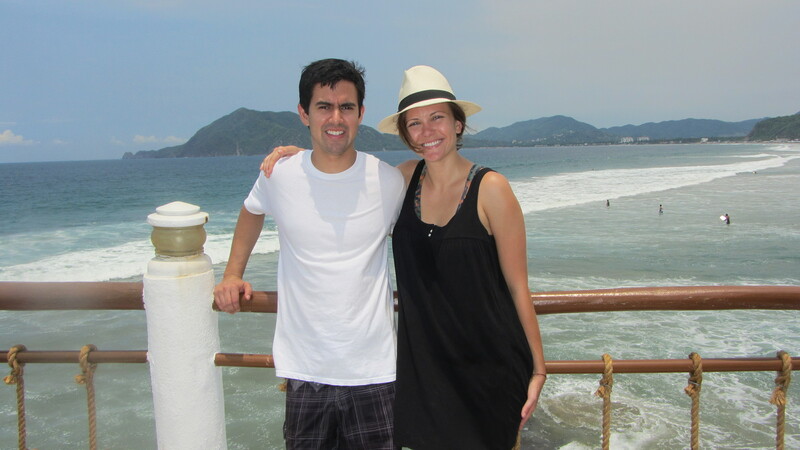 We took an early morning bus to the beach in Manzanillo, where we spent three days relaxing in the sunshine, playing cards, eating fresh fish tacos and guacamole and mangoes, and frolicking in the ocean. It was the perfect way to end a fantastic vacation. In conclusion, Mexico is the best… why is no one talking about Mexico? Life marches on as usual in Xela, for the most part. Unfortunately I’ve had one bizarre illness after another since my return from paradise, the most recent being that I was bitten by a dog and now have to receive rabies shots at a very sketchy public health clinic. Weird. My life is weird. However, aside from my new parasite (who wants to name this one?) I am finally feeling better and am excited to make the most of my last three weeks here. Hard to believe how fast it all has gone by.